If you have done a search recently on the internet for the Destin Pelican Beach Resort or done a related search you probable are seeing this website pop-up. Often times we pop up above the big money people such as trip advisor, resort quest, expedia, book-it, vrbo and others. The reason for this is because we put so much effort into posting fresh content complete with pictures, videos, and information relevant to Destin and/or the resort. We own unit #1004 at Destin's Pelican Beach Resort. This is a picture of my wife and I. We are in love with each other and with the Pelican Beach Resort. 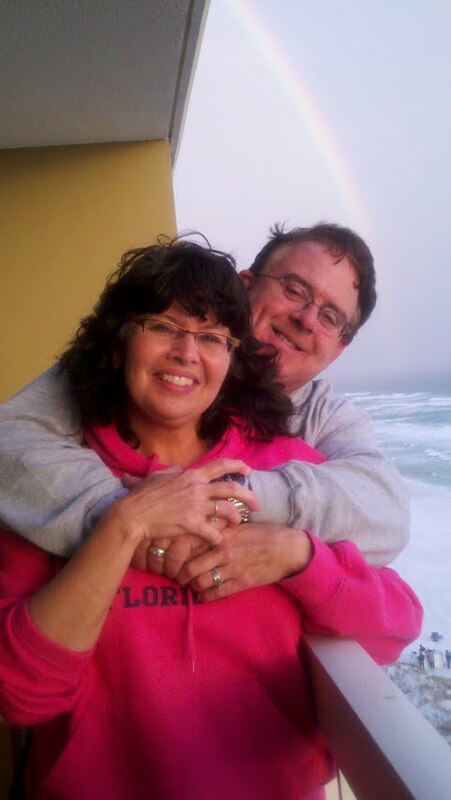 If you look closely, you can see a rainbow in the background as we stand on our patio at the resort. The temperature this month has been in the high 60's and low 70's. I guess our snowbirds(booked in our unit) are enjoying this view right now.